Rally obedience is a fun sport for dog and owners. Each dog and handler team heels from one sign to the next completing each designated exercise. 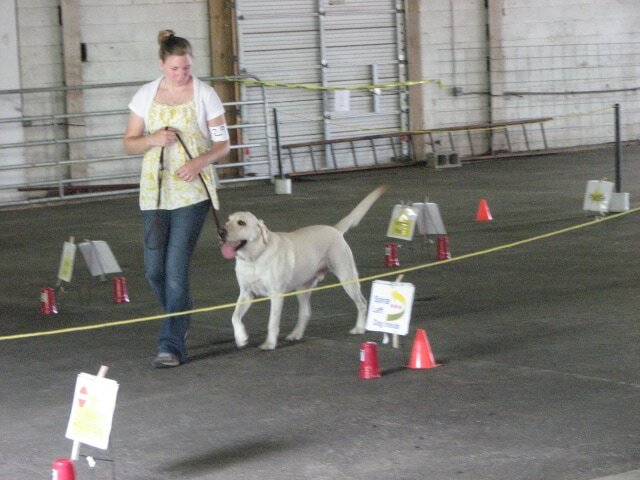 Rally differs from obedience trials in that the exhibitor may communicate with the dog by giving multiple commands, hand signals and encouragement. This is a timed event only counting in case of a tied score. This sport is recognized by the American Kennel Club, C-Wags and other competitive groups. It is a great training style to motivate your dog and continue increasing its vocabulary and obedience skills to achieve recognition and titles. It is a fun sport that builds confidence, focus and communication skills for you and your dog. Classes meet for training and practice run-thrus weekly. ​Check the schedule and register for a class or run-thru.